Those visiting Anchorage and keen to play a round of golf will find a handful of good courses to choose from within the area. Located on O'Malley Road, on the southern side of the city, the Anchorage Golf Course is likely to be your first choice. 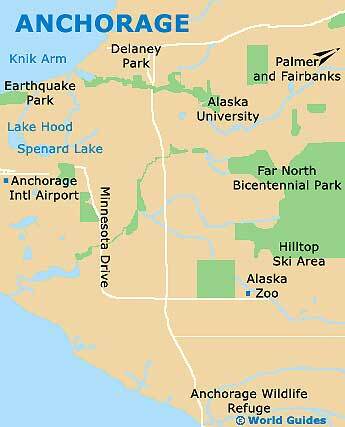 After your game, you may like to enjoy a meal at the O'Malleys on the Green restaurant, or pay a visit to the extremely nearby Alaska Zoo. A little closer to the city center is the Par T. Golf Course on East 74th Avenue, which stands on the New Seward Highway US-1 and nearby Taku Lake. Both of these courses come with 18 holes, while if you are short of time and looking to play a quicker round, then consider checking out the nine holes at either the Russian Jack Springs or the Tanglewood Lakes clubs. The Anchorage Golf Course is an attractive public 18-hole course, with fairly inexpensive fees. Featuring fast greens, water hazards on some holes and fairways lined with mature trees, the course was built in 1987. The impressive 18-hole Par T. Golf Course offers simulated facilities, which allows visitors to play numerous world-wide courses. Fees depend on the number of players and are charged by the hour. Russian Jack Springs Golf Course is a popular 9-hole public course, with artificial turf greens and tee boxes. Featuring mature trees, variable width fairways and sand bunkers, this challenging course boasts inexpensive golfing fees and was built in 1970. The Tanglewood Lakes Golf Club is a popular 9-hole public course, known for its fairly inexpensive golfing fees. Offering an undulating landscape with water features and sand bunkers, Tanglewood Lakes dates back to 1996.